We left Mesa, Arizona Sunday, June 1, stayed overnight in Albuquerque’s High Desert Campground, and arrived Monday night in Colorado Springs. 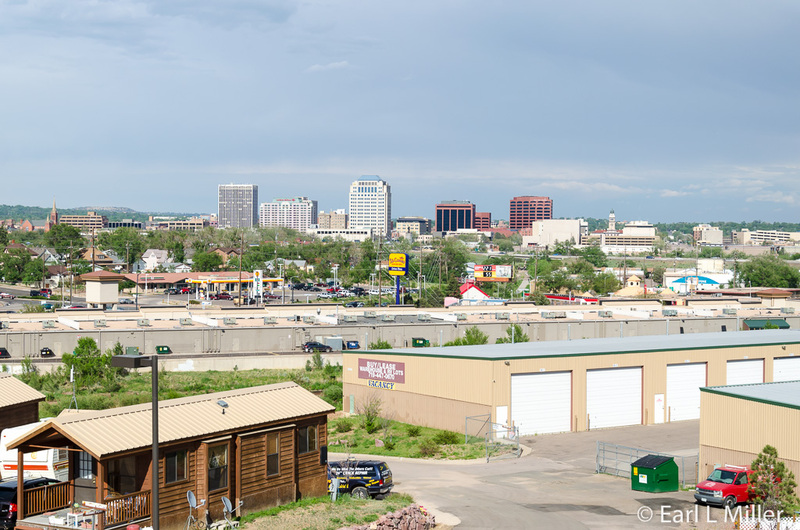 We’re staying at Foot of the Rockies RV Resort and Storage, on a hill overlooking downtown. The campground is a small one, 44 sites, with the basics of 30/50 amps electric, water, sewer, and picnic tables. Other amenities are a tiny laundry, children’s playground, and a variety of barbecue grills under a covered pavilion. No public restrooms exist. Major pluses are its location, friendly and helpful management, and a camping rate of $575 a month including electric. They also have overnight and weekly rates. I have received several emails wanting to know more about our new 2013 Itasca Ellipse. 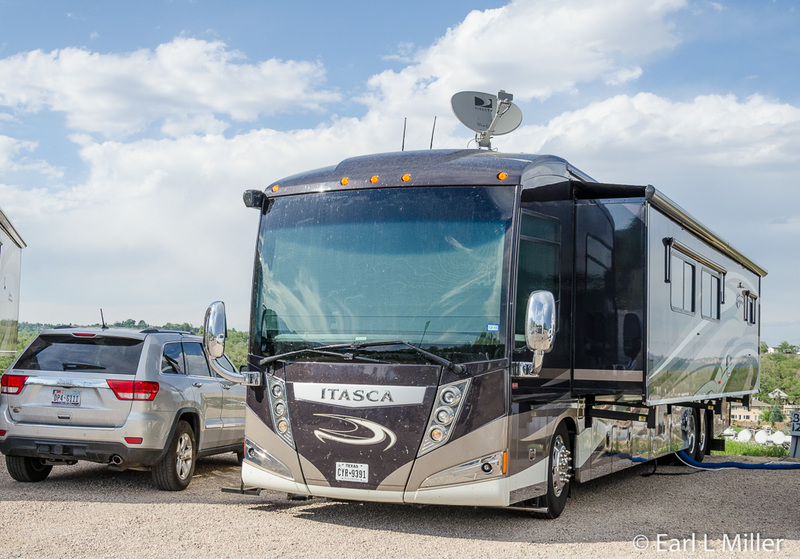 Itasca is Winnebago’s other RV line, and the Ellipse is their most luxurious unit. Our RV is 43 feet in length and has three slideouts. The one on the driver’s side runs the full length of the coach and is 36" wide. The two ( 26" and 29") on the passenger side incorporate everything but the half bathroom. 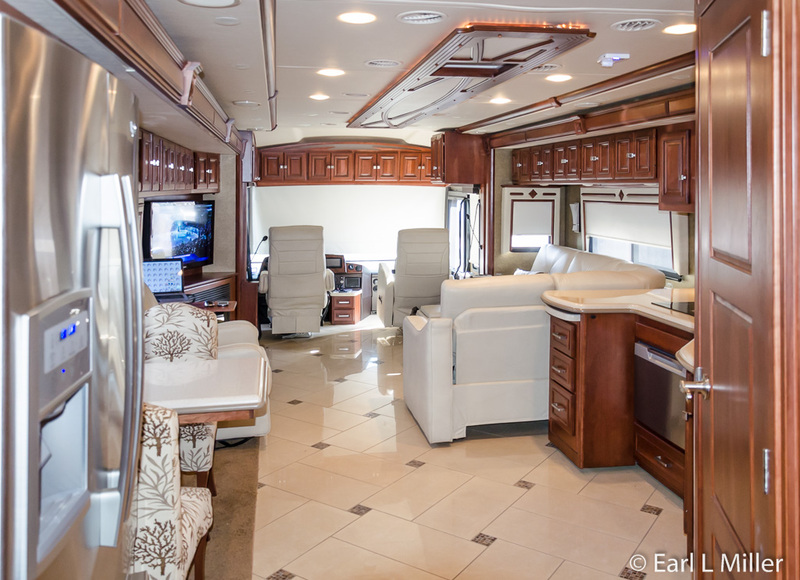 When fully opened, the area is 550 square feet, so our coach becomes a condo on wheels. Some features help justify the price tag. 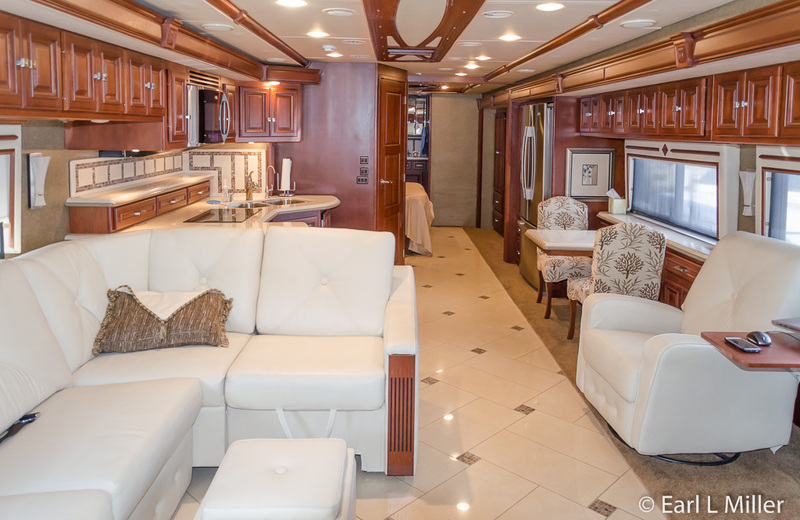 These include a dishwasher, bathroom-and-a-half, large J-shaped couch with two ottomans, big screen 42" television, porcelain tile floors throughout, and no propane. That’s right. The whole coach is electric including the fireplace; Maytag, residential refrigerator with ice and water in the door; and an induction, two burner stove. We’re also enjoying the large shower, king-size bed, TV in our bedroom, separate washer and dryer units, and Ultra Soft, leather furniture. Storage is everywhere you look: the inside of the ottomans, an extendable kitchen counter with three long drawers, and an oversized pantry. The exterior has some unusual features. The water hose and electric cord are on motorized reels while an Aqua-Hot system allows for instant hot water. The unit has a 32" television built into the exterior wall, a Norcold cooler/freezer, and a pullout tray extending more than five feet in either direction. From chain restaurants such as Denny’s, IHOP, Paneras, Texas Roadhouse, and Village Inn to a vast variety of ethnic eateries, dining choices are abundant in Colorado Springs. We have returned to four, which we recommend when visiting this city. Barbecue fans will enjoy Rudy’s located at 315 S. 31st Street. It’s open every day but Monday. It’s a BBQ cafeteria, where you buy meat by the pound or half pound, then purchase a variety of sides including cole slaw and banana pudding. If you remember sodas sold in bottles, their drinks will be a familiar sight for you. You can select from ribs, turkey, brisket, pork, chicken, and sausage. If you favor Italian food, check out Luigis, in business for 56 years. Select from a menu heavy on pasta and chicken choices. Portions are massive, and the decor, red and white checked tablecloths and Chianti bottles, compliments the food. You’ll find friendly servers at this restaurant located at 947 S. Tejon Street. Open Tuesday through Sunday from 5 p.m.
Are Old World German dishes what you crave? We visited Edelweiss in 2012 and found the food and service just as good this year. The menu is extensive with half orders available on many dinners. Those having a difficult time choosing can select one of three combination plates. The atmosphere is definitely Bavarian. On Fridays and Saturdays, strolling musicians accompany dining. Located at 34 E. Ramona Avenue, this restaurant is open daily starting at 11:30 a.m. Serving Colorado Springs since 1982, Mason Jar is our choice so far for American comfort food such as real mashed potatoes, fried chicken, and fresh baked, buttermilk biscuits. They serve drinks in Mason jars. The atmosphere will remind you of a lodge. Open daily for lunch and dinner, you’ll find this restaurant at 2925 W. Colorado Avenue. Earl and I have spent Tuesday through Friday acclimating to the high altitude. We did make a stop at Colorado Springs’ Convention and Visitors Bureau on Friday. That’s a good place to obtain brochures ranging from attractions to restaurants and lodging. The staff is willing to answer your questions. It's located at 515 S. Cascade Avenue. Drive around Colorado Springs and you see major roadways called Nevada, Tejon, Cheyenne, and Colorado. General William Palmer, the original owner of Denver and Rio Grande Railroad, founded Colorado Springs. His wife, Queen, named these streets after the area’s mountains and rivers. Stay tuned as we revisit attractions and discover new ones.